The DELTA team on this project include Lead Instructional Designer and Project Lead Cathi Dunnagan, Instructional Media Producer Arthur Earnest, Creative Director Mike Cuales, Multimedia Specialist Rich Gurnsey, Lead Project Coordinator Samantha McCuen, VR Programmer Stephen Waddell, Production Assistant Michael Castro, and student Immersive Media Designer Rhett Hissam. 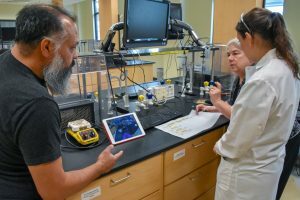 A team of DELTA staff members worked with Teaching Associate Professor and Director of Organic Chemistry Labs Maria Gallardo-Williams in the pursuit of creating virtual organic chemistry lab experiences. Through an exploratory grant, the team worked to capture five different face-to-face organic chemistry experiences in virtual reality. The experience transports the user into the lab room as if they were there in person. Gallardo-Williams initially started thinking about this project to serve populations of students who cannot attend the in-person labs for various reasons. There are students who may become pregnant and cannot complete the lab, students who deploy in the military during the semester and students with disabilities that make it more difficult to complete the lab. With these populations in mind as well as goals of a student-focused and inclusive experience, Gallardo-Williams and the DELTA team set out to produce a series of five virtual reality organic chemistry labs. These labs are examples of a perfect lab scenario. There are no distractions and the experience can easily be paused or played back if the user misses something. It is a personal experience where the user sees a graduate teaching assistant (TA) instructing the lab, just as they would in the face-to-face version. The TAs are not actors, but TAs who have taught the lab many times before in the same lab room. The TAs cover diverse populations and are examples of the people you’d encounter every day on NC State’s campus. They’re similar and relatable to undergraduate students. This student-centered approach is what sets the experience apart from others. This experience is students teaching students, just as you would get in the face-to-face lab experience. Arthur Earnest and Mike Cuales suspend a GoPro Fusion 360° camera from the ceiling to capture the first-person point of view. To emulate the face-to-face lab with virtual reality, the team used a first-person point-of-view approach with the camera where it actually looks like you are the person completing the lab. 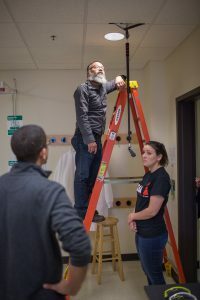 To achieve this, the team hung a GoPro Fusion 360° camera from the ceiling using a selfie stick. The camera rests right above the student stand-in’s nose. They complete the experience with limited body movement as to not obstruct the final experience. “The 360° first-person point of view leads to an immersion for the viewer of being completely in a chemistry lab. What we were going for was this being the perfect chemistry lab with a TA talking directly to you. Because of that and with added graphics and animations, the information is more direct, concise and more whole for the actual student in the experience,” said Earnest. In preparation to complete the virtual reality lab experience, students complete the same pre-work as they would in the face-to-face lab. They come into the experience knowing the same information as other students. The experience starts with a welcome from the TA followed by an overview of the lab at a whiteboard. The student is asked a series of critical thinking questions where they have to predict what may happen in the lab experiment. Then, the student moves on to the lab table where a TA talks them through the experiment. The interactivity of the lab is another aspect that distinguishes this experience from other VR projects. Students are asked questions where their answers determine the path they take through the experience. For example, in the infrared spectroscopy lab, each student can choose one of four “mystery compounds.” They are asked to predict what they think their selection is based on the resulting infrared spectrum. Using gaze navigation within the VR headset, the student selects answers and completes the experiment to determine the compound. “Giving students a choice makes the VR experience more engaging and more true to life,” said Lead Instructional Designer Cathi Dunnagan. When the student finishes the experiment, it brings them back to the whiteboard where the TA walks them through an analysis and asks the critical thinking questions again to help them discover whether their predictions were correct and if not, why not. “The experience is all about learning and student success,” Dunnagan added. The process to bring these virtual reality labs to life is extensive. Dunnagan noted that the project coordination work of Samantha McCuen was absolutely essential to managing the many moving parts. Cathi Dunnagan makes refinements to the flowchart during a test shoot. The process begins with Earnest and Dunnagan visiting the face-to-face lab to observe how the TA teaches the lab and how the students go through the process, identifying any trouble points for students. From there, the team discusses with Gallardo-Williams and the TAs the most important information from each lab that needs to be captured and explained in the virtual experience to ensure VR students will successfully achieve the same learning objectives as the face to face students. These conversations lead to the creation of a detailed flow chart that maps out each piece of the experience from start to finish and serves as a guide to video production, asset creation and VR experience programming. Then, the team conducts a test shoot where they work out any issues as well as note any changes to the flow. There is a day dedicated to rehearsing the speaking parts with the TAs so they are familiar and comfortable in front of the camera. The actual shoot is next where the team captures 360° video of each scene of the experience. After the 360° video is captured and edited, a rough cut is sent to Multimedia Specialist Rich Gurnsey who adds the graphics and animations and edits the rough cuts into individual scenes. According to Creative Director Mike Cuales, the graphics and animations differentiate this project from others by adding interactivity to 360° video to further augment the virtual environment. A view from inside the virtual reality experience. The TA, Lyniesha Wright, talks students through the experiment. The graphic seen on the whiteboard is an example of the added graphics/animations to the 360° video. 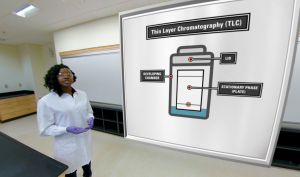 Throughout the experience, different graphics and animations are shown on the whiteboard to further illustrate the concepts, tools and processes that the TA explains in the various labs. Some of Gurnsey’s designs include labeled compounds and tools, computer simulations, up-close views of important details, interactive questions with feedback and answers, and safety warnings and instructions. Once the assets are added to the 360° videos, the project is passed on to VR Programmer Stephen Waddell to put each scene together in the correct order. Waddell uses Gurnsey’s designs to add in “pop up” graphics that appear based on the student’s interaction within the experience. All of the interaction within the experience from moving to the next scene to answering an on-screen question is the work of Waddell. The final product is an interactive virtual reality lab experience that emulates a perfect face-to-face lab. The prototype of the infrared spectroscopy lab experience was piloted in summer 2018 with a test of 60 students. Gallardo-Williams randomly selected half of the students from the face-to-face labs to complete the virtual lab experience. The students in the face-to-face labs served as the control group. From the worksheet results for that lab, the two groups performed the same. Two weeks later, all students completed an exam based on what they had learned in the lab. Gallardo-Williams found that the students who completed the virtual reality lab actually performed statistically better in retention and application of the material. Gallardo-Williams plans to launch the set of labs in fall 2019 as fully distance education-based organic chemistry lab course. In addition to the virtual reality labs, the team also produced a Matterport virtual tour of the Fox Hall lab and instrument rooms. The tour incorporates the NC State Organic Chemistry SMART videos produced during a previous DELTA Grant. The tour will be available to students as part of their pre-work to completing the labs. Gallardo-Williams, Dunnagan and Cuales are presenting a poster at the ELI 2019 conference in February about the virtual reality lab experiences. “In general, we think that ongoing exploration, development and evaluation of immersive technologies will become increasingly important as our student population and workforce evolves and requires more experience-based learning opportunities,” said Cuales. While Gallardo-Williams has teamed up with DELTA before in the creation of SMART videos, this is the first time virtual reality has been explored as a learning tool for distance education students. The fully distance education virtual reality labs will have the ability to reach and serve populations of students who previously were unable to complete the in-person labs.